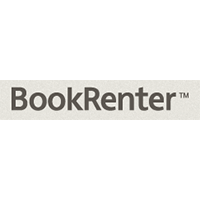 ● BookRenter offers free standard shipping on all books, every day. ● BookRenter usually offers limited-time discounts which can be up to 72% on school items including flash drives, and more. 5% off coupons are also offered for a limited time. ● At the same daily rate, you can extend your rental. ● You can return the books within 21 days—no questions asked. Book Renter rents textbooks for college level classes. The visitor can search for books via the search box prominently placed on the home page in the center of the upper half of the page. Book searches can be done by either ISBN number (stock number), title or course number. Visitors can also shop using the tabs at the bottom of the home page. Tabs for popular rentals and top categories can be found at the bottom of the page. There is also links at the bottom of the page that help to navigate the site. Shipping is free both ways. For most up to date offers check out Book Renter on Facebook and Twitter or contact Book Renter Support for any questions.